Hardly any measure in the course of the conservation of glass paintings is as difficult to define as the scope of preliminary cleaning. 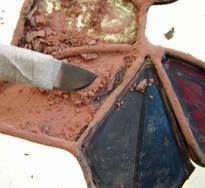 The reasons lie on one hand in the numerous different types of dirt (such as dust, soot, putty, lime, coloured lacquer, bird droppings and other deposits. 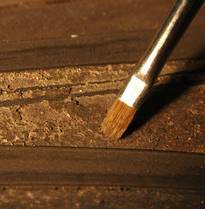 On the other hand, the sensitivity of the underlying paint layers determines the type of cleaning measures to be selected. What's more, it is frequently the case that unfortunately, no preliminary testing is performed in advance of the drafting of the call for tenders - or that the glass paintings are not directly accessible, but can rather only be viewed from a distance of 5 or even 20 m with binoculars. Would you entrust your care to a physician who examined you from such a distance? 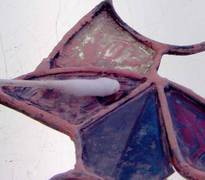 That is why we only discuss the individual steps and techniques involved in cleaning the particular object after the glass paintings are accessible to us in the studio, on the work-table. This takes place in the context of a detailed studio meeting. 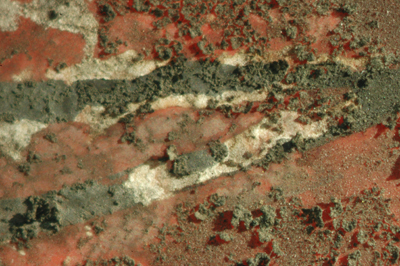 Detail of a medieval glass painting in its previous condition. 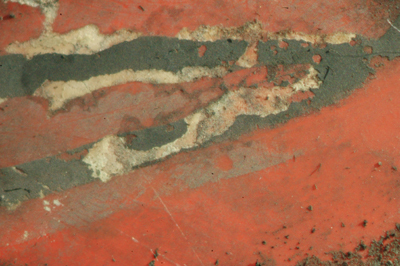 Detail of the same spot after cleaning, in the condition after completion of work. Painstaking exposure of a medieval leaded glass which was covered with wall paint. 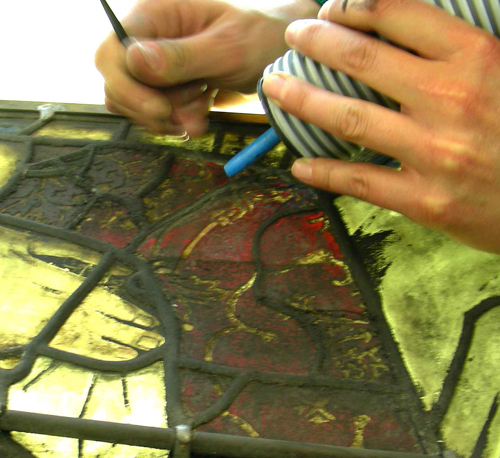 Subsequent cleaning of the medieval leaded glass with cotton swabs. Gentle, fine-tuned tools are necessary for differentiated cleaning. In this context, items such as steel wool of cleaning cloths are not suitable. The first careful sample cleaning of a fragile surface. Removal of dirt while constantly vacuuming to minimise the formation of dust which is harmful to one's health.